Dixie Coskie | Author of the critically acclaimed "Unthinkable: A Caregivers Companion"
UNTHINKABLE: A Mother’s Tragedy, Terror and Triumph through a Child’s Traumatic Brain Injury is a powerful memoir – moving and very real. 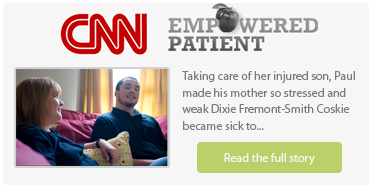 It will bring you into a realm where body, mind, and spirit are pushed to their limits sharing hope, strength, and inspiration as Dixie relates the story of her son’s remarkable recovery from a severe traumatic brain injury. Each chapter includes insights and tips for families and caregivers on coping, managing stress, and surviving the trauma of brain injury. New Award – Winning Release! Now Available! How to successfully survive a brain injury! 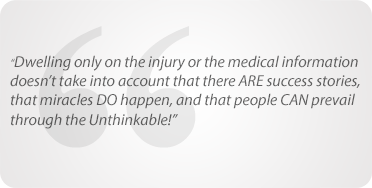 Unthinkable: Tips for Surviving a Child’s Traumatic Brain Injury written in an easy-to-read bulleted format, will help parents, caregivers, friends and health care professionals navigate through the new terrain of an injured child and guide them step-by step through the recovery process! NOW AVAILABLE FROM THE BRAIN INJURY ASSOCIATION OF AMERICA | SPECIAL OFFER! …Opened my eyes to the real and powerful emotions, hardships and obstacles that families face after traumatic brain injury and throughout recovery and the long rehabilitation process. For press and media inquiries please contact Dixie via the contact page. You can also download the media pack HERE.